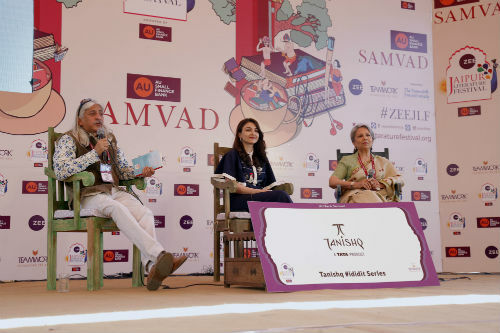 Jaipur: Dance, history and civilization, Bollywood, terrorism and investigative journalism, and the art of creating compelling literature were themes which lit up the stage in sessions that drew staggering crowds on the penultimate day of the ZEE Jaipur Literature Festival 2018. The celebrated danseuse Sonal Mansingh began the session The Dancer and the Dance by asking her biographer Sujata Prasad, “Why did you choose me for your book?” Prasad replied, “I plunged into your life because it was a place of refuge away from my intense and emotional phase.” She described Mansingh as a “mysterious persona”, whose life “radically changed her world view”.Sonal revealed that her “guru’s stick was the guiding star” of her life and taught her a lot: “You would be hit if you made a mistake. That kept you disciplined and on your toes.” The legendary artiste shared an anecdote: “One summer afternoon, when I was not dancing well, my guru asked me to look out of the window and I saw monkeys dancing, and he asked me if there was a difference between my dance and theirs.” After that, she began to look for the differences between the monkeys’ automated moves and her dance. Reminiscing further, she reflected, “I am glad we did not have cell phones back then. We observed paintings and people and learnt from them. The Written World: The Power of Stories to Shape People, History and Civilisation found renowned philosopher and literary criticMartin Puchner in conversation with Homi K. Bhabha who brought up the question of the politics of world literature, which according to the former, “is in congruence with the politics of post-colonial literature. The politics is interventionist in the sense that it discovers and establishes previously unacknowledged texts adding new voices beyond the canon. The creation of a new narrative becomes integral”. Puchner gave the example of the recent publication of the African Epic of Sundiata which was previously only transmitted orally, and points to a growing interest in the oral tradition of texts. Creating a novel is a distinctive art and a gift which needs to be honed. Five great exponents of the novel took to deconstructing what it takes to craft one with painstaking precision, in The Art of the Novel: On Writing Fiction. “It is a feeling for life, for language and a need to tell a story,” said moderator and author, Chandrahas Choudhury talking about the skills that amalgamate a novel, in conversation with Amy Tan, Chika Unigwe, Helen Fielding, Joshua Ferris and Michael Ondaatje. Amy Tan revealed to the panel that after her first book that came to her naturally, she had to struggle to produce work that effortlessly. Having felt the same,Joshua Ferris found himself “pulling his teeth” to create stories with ease after his first book. Presented by ACCESS Health International, Innovations in Healthcare : The India Example featured American biologist William A. Haseltine, best known for his ground-breaking work on HIV/AIDS and the human genome, where he praised India for innovating treatment methods and medical research, even though it continues to have an international perception of being backwards in providing health care. However, he cited India as one of the countries that has contrasting attributes in terms of providing affordable medication, but with a huge number of untreated patients. Amrita Tripathi, author of books like The Sibus Knot and Broken News, talked about the importance of mental health, and how living in urban landscapes has created a fissure in the way humans experience their lives in isolation. The Feminine Gaze: Women Writing Memoir highlighted how memoir writing is a powerful medium to articulate traumas and histories that cannot or should not be fictionalized, particularly for women writers who are often sidelined in favour of male voices and other normative narratives. A distinguished panel of writers examined this issue of memoir writing and its close connections to gender, cultural and political discourses. However, Juliet Nicolson the author of A House Full of Daughters found the use of the word “feminine” in the session title as problematic, as she felt that women write with as “much truth and honesty as men do” and therefore should not be “differentiated”. River of Life River of Death: The Ganges and India’s Future highlighted the importance as well as the plight of the Ganges and how the issue of cleaning the river has been brought up for decades and a lot of money has been spent and several political parties have won and lost elections basis the issue, but the situation of the Ganges has gone from bad to worse. Financial Times Asia News EditorVictor Mallet said that the issue requires commitment from the government as well as people themselves who simply need to make an effort to save it from ongoing pollution and since it’s a living river it will cleanse itself over time. He went on to say that cleanliness of the Ganges should by a top priority in the public consciousness alongside world issues like Global Warming. The Mahakavi Kanhaiyalal Sethia Award for Poetry, supported by the ZEE Jaipur Literature Festival was awarded to Punjabi language poet and writer Shri Surjit Patar. At the JaipurBookMark, the B2B arm of the Festival, Yatra Books announced a new imprint Tethys to expand its scope beyond translation and delve into relevant issues of global importance. This imprint was launched with two international titles by Dr. William Haseltine – Every Second Counts and Voices in Dementia Care. At an Invite-only session for the shortlisted writers of Jaipur Bookmark’s New Writers Mentorship Programme, and winners of the ZEE Jaipur Literature Festival Writing Competition. Featured a panel discussion where professionals talked about the intricacies of the publishing and pitching process, and shared priceless advice with the aspiring writers. Publishers and literary agents includingUrvashi Butulia, Mita Kapur and Manasi Subramaniam helped dispel certain popular myths and provided useful tips. They advised writers to “do their homework” and research different publishing houses before sending in their manuscripts. Butalia highlighted the importance of sending one’s book proposal via email only, with a well-written cover letter and synopsis, instead of verbally pitching to agents and publishers at networking events, or emailing them with an idea that has not been fleshed out. Amidst this heady mixture of light-hearted banter and intellectually charged debate, sessions ended with applause on the fourth day of the ZEE Jaipur Literature Festival 2018.